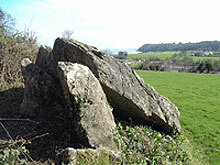 Later, Bronze-Age farmers who left signs of their passing at Wall's Hill and Broadsands Tomb. There is evidence of an Iron Age promontory fort on Berry Head, but this was probably destroyed when the Napoleonic forts were constructed. A scatter of Bronze Age and Romano - British material has been found across the headland, and there are remnants of a strip field system to the west of the site, suggesting the area was farmed communally in the medieval period. ... whilst more recently during the Victorian era both the Limestones and Sandstones were massively quarried and used to build the grandest houses and civic buildings in the Bay. The utilisation of local materials for generations is particularly evident at Berry Head National Nature Reserve where the limestone from the headland itself was used as a building stone for the two Napoleonic forts. In addition, many limestone quarries were worked both around Torquay and Brixham to provide stone for Regency and Victorian development, especially the exclusive coastal resort of Torquay. The Victorian villas that give much of Torbay its distinct character are the result of a planned development programme to accommodate visiting gentry. 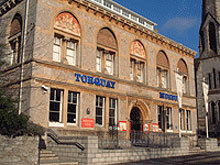 Many fine public buildings were constructed which reflected the prosperity of the Bay, including several churches of architectural significance, Torquay Town Hall and The Pavilion. Less magnificent but still with local stone, housing was also provided for the poor. The area still abounds with these sites of cultural heritage together with a number of closely associated limekilns. In addition to the residential buildings, fascinating structures in stone such as windmills and viaducts still survive as points of interest. Where naturally weathered, these buildings and structures offer a marvellous opportunity to view rich coralline faunas of the Devonian age. The wealthy Victorians who lived in the developing upmarket resort loved the marble quarried from Petit Tor and it was of such high quality it was in demand in London and as far away as New Zealand. Stone-working families moved to the area and St Marychurch became a village of marble masons and later the Jenkins Marble works opened. Its most famous products were beautiful circular tabletops, inlaid with a colourful variety of local limestones, one of which was once displayed in the former Geological Museum in London, and many other items can today be seen in Torquay Museum. Exhibits at the museum also include the parallel development of the Torquay terracotta industry, which exploited deep-red clays found within the lower part of the Permian red-bed sequence. In 1842 low-grade iron ore was discovered in the limestone plateaus at Brixham and Sharkham Point. The ore was commercially mined for smelting and for the use in the manufacture of anti-corrosion paint began. By the time the paintworks took the name of the Tor Bay Paint Co in 1895 the company was exporting all over the world. Amongst the contracts held by the company the paint was used in the maintenance of Victoria Falls bridge on the Zambesi River. Having been designed in England, the bridge was transported from Europe in pieces and was assembled on site, bridging the Zambezi River and linking Zimbabwe and Zambia in 1906. 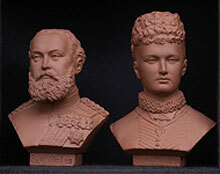 The Torquay terracotta industry, regarded the finest in England. 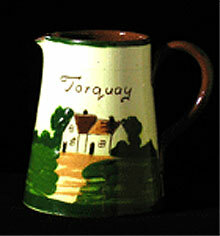 The first pottery opened in 1867 and produced a wide variety of articles including the famous Devon Mottoware. The dark red and brown colours of the products was obtained by mixing local red clay with manganese, Dorset clay and flint.